J Crew’s classic mirror ballet flats (64862, $135) come in metallic silver. Sizes 5-9.5, 11 & 12. They were $99.99 in-store on 6/8 and then cut to $49.99 in-store on 6/20. Size 7.5 – This was a quick try on and I forgot I even had the photos. The 7.5 fit exactly, but I can’t recall if that felt like it might the best size or if I wanted to try an 8. ETA: I tried on the size 8 and they seemed to slip off my feet a bit. I think I would go with a 7.5. Reminder, I wear 7.5 and am usually an 8 in most J Crew shoes. So consider taking your regular shoe size, not taking your J Crew size if you always find yourself sizing up like me. The inside of the shoe said leather sock leather sole, so there would be some stretch capability. The only deal is that if they start off tight, the toe box area might shoe the indentation of your toes if you’re wearing them to stretch them out. I think I would go with 7.5 and hope they stretched pretty. 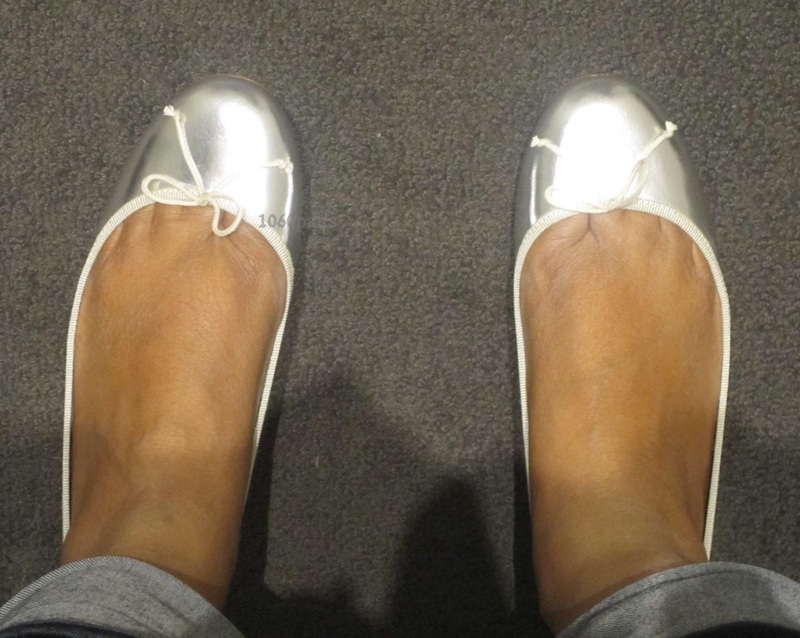 Example of toe indentation in the Kiki mirror metallic ballet flats (review). I love the mirror metallic. Thumbs up on the classic style as well. There was a 30% promo when I tried them on and I still passed for a net $70. After wearing the Ceces, I prefer them over the regular ballet silhouette. Hello There. I found your blog using msn. This is a very well written article. I will be sure to bookmark it and return to read more of your useful info. Thanks for the post. I will certainly return. I just want to say I am just beginner to blogging and certainly enjoyed your web blog. Most likely I’m planning to bookmark your blog . You actually have remarkable stories. Thanks a bunch for revealing your blog. I simply want to mention I am just all new to weblog and honestly enjoyed you’re web page. Probably I’m planning to bookmark your blog post . You definitely come with terrific posts. Appreciate it for sharing your webpage. I just want to mention I am newbie to blogs and actually liked you’re blog. More than likely I’m likely to bookmark your blog post . You certainly come with wonderful articles. Thanks a lot for sharing with us your web site. I simply want to tell you that I am just very new to weblog and definitely enjoyed you’re web-site. More than likely I’m want to bookmark your site . You actually have really good writings. Regards for sharing your web-site. I simply want to tell you that I am just new to blogging and truly savored you’re blog site. More than likely I’m likely to bookmark your blog post . You amazingly come with superb stories. Appreciate it for sharing your website. I just want to tell you that I am just all new to blogging and site-building and seriously liked your blog. More than likely I’m planning to bookmark your website . You really have excellent writings. Cheers for revealing your website page. I simply want to say I am new to weblog and absolutely savored your web-site. Most likely I’m likely to bookmark your blog . You really have very good article content. Thank you for revealing your website page. I simply want to say I am just newbie to blogging and site-building and truly loved you’re blog site. Probably I’m want to bookmark your blog post . You amazingly come with impressive article content. Thanks for sharing your website page. I simply want to tell you that I am just very new to blogging and site-building and seriously loved your website. Most likely I’m going to bookmark your website . You absolutely have outstanding articles. Cheers for sharing your webpage. Whats Going down i am new to this, I stumbled upon this I’ve found It absolutely helpful and it has helped me out loads. I am hoping to give a contribution & assist different users like its aided me. Great job. I simply want to say I’m very new to weblog and really loved this web site. Probably I’m going to bookmark your blog post . You actually have tremendous posts. Many thanks for revealing your web page. The last drop makes the cup run over. I just want to mention I am newbie to blogging and seriously loved your page. Most likely I’m likely to bookmark your website . You really come with good stories. Regards for sharing with us your website. My spouse and i felt now thrilled when Peter managed to conclude his homework while using the precious recommendations he got using your site. It’s not at all simplistic just to continually be handing out instructions that many most people could have been trying to sell. And we also understand we’ve got the writer to give thanks to because of that. The entire illustrations you made, the easy blog navigation, the friendships you assist to foster – it’s everything terrific, and it is making our son and our family do think that issue is thrilling, which is extraordinarily essential. Thanks for all! First off I want to say wonderful blog! I had a quick question in which I’d like to ask if you don’t mind. I was interested to find out how you center yourself and clear your mind prior to writing. I have had a tough time clearing my thoughts in getting my ideas out there. I truly do enjoy writing however it just seems like the first 10 to 15 minutes are lost simply just trying to figure out how to begin. Any recommendations or hints? Kudos! I would like to voice my respect for your generosity in support of men and women that really want help with this one theme. Your personal dedication to getting the message up and down appeared to be remarkably invaluable and has frequently encouraged those much like me to attain their objectives. Your entire warm and helpful facts denotes a lot a person like me and even further to my office colleagues. Thanks a lot; from everyone of us. fantastic put up, very informative. I ponder why the opposite experts of this sector don’t understand this. You should continue your writing. I’m sure, you’ve a huge readers’ base already! Somebody essentially lend a hand to make seriously posts I’d state. That is the first time I frequented your website page and thus far? I amazed with the research you made to create this actual submit extraordinary. Wonderful process! Helpful info. Lucky me I found your site accidentally, and I am shocked why this twist of fate didn’t came about earlier! I bookmarked it. We’re a group of volunteers and opening a new scheme in our community. Your web site provided us with valuable information to work on. You’ve done a formidable job and our whole community will be thankful to you. I wanted to send you a bit of remark to be able to thank you very much the moment again about the nice suggestions you’ve documented here. It’s certainly surprisingly open-handed of people like you to deliver unhampered what exactly a few individuals might have distributed as an electronic book in making some bucks on their own, primarily since you might have done it in the event you desired. The secrets also acted to be the easy way to be certain that many people have the same zeal just as my very own to see a whole lot more concerning this problem. I am sure there are some more fun periods up front for folks who look over your site. Hi, i think that i saw you visited my web site so i came to “return the favor”.I’m trying to find things to enhance my web site!I suppose its ok to use a few of your ideas!! This is a very good tip especially to those fresh to the blogosphere. Brief but very precise info… Many thanks for sharing this one. A must read article! I am continuously browsing online for articles that can benefit me. Thanks! you are actually a good webmaster. The site loading speed is amazing. It seems that you are doing any unique trick. Moreover, The contents are masterpiece. you’ve performed a excellent task in this matter! Thanks, I’ve just been searching for info about this topic for a while and yours is the greatest I have discovered till now. However, what concerning the conclusion? Are you positive about the supply? Definitely, what a fantastic website and revealing posts, I will bookmark your blog.All the Best! I am continually searching online for ideas that can benefit me. Thank you! Howdy, I do think your site may be having internet browser compatibility problems. Whenever I look at your website in Safari, it looks fine but when opening in Internet Explorer, it’s got some overlapping issues. I just wanted to give you a quick heads up! Besides that, great blog! Generally I do not learn article on blogs, but I wish to say that this write-up very pressured me to try and do it! Your writing style has been amazed me. Thanks, very great post. You made some really good points there. I looked on the net to find out more about the issue and found most individuals will go along with your views on this site. You made a number of good points there. I did a search on the subject matter and found a good number of people will consent with your blog. Thank you so much for providing individuals with an exceptionally breathtaking opportunity to read in detail from this site. It is often very amazing and also stuffed with a lot of fun for me personally and my office fellow workers to search your website at the least thrice in 7 days to see the fresh things you have got. Not to mention, I’m so usually pleased for the superb information you serve. Some 2 areas in this posting are in reality the finest I’ve ever had. I together with my guys appeared to be reviewing the excellent points located on your web site while all of a sudden came up with a horrible feeling I had not thanked you for those secrets. These guys became certainly warmed to learn them and have now certainly been having fun with these things. Thanks for really being so considerate as well as for getting these kinds of high-quality ideas most people are really eager to discover. My very own honest apologies for not expressing appreciation to you earlier. Hi, I do believe this is a great blog. I stumbledupon it 😉 I’m going to come back yet again since i have book-marked it. Money and freedom is the greatest way to change, may you be rich and continue to help others. We’re a group of volunteers and opening a new scheme in our community. Your website provided us with valuable info to work on. You have done an impressive job and our whole community will be grateful to you.